Fly Classic Stub Axle "fix" How To! Since I was asked (challenged?) to do a pictorial on how to convert a Fly Classic from plastic stub axles to a solid axle, I am posting this in response. I didn't set up a studio or special lighting or a tripod or a remote shutter release- all of these photos are hand held at my workbench with available light. Sorry if you are on dial-up and the pictures take a while to load. What good is a low-rez photo that doesn't show you anything? Preface: Up until the Fly Fast Kits (and to a lesser extent- the 10th anniversary cars) were released, many new 1/32 racers had to lay out some bigggggg bucks to get their hands on a Fly Classic. I find it amazing what prices are being asked for the early "C" Fly cars on ePay. The Fly Classics are not perfect slot cars and need some TLC to make them run acceptably. I feel that the tune-up effort is worth the reward of driving these cars when they are made right. Fixing the wobbly front wheels (what I will be showing you how to do) is one of the most often suggested tuning techniques for the Fly Classics. There is more than one way to do this conversion- my method is fast and easy. You may have another method that you prefer- that's great... this is just my favorite. I am using the Fly Fast Kit Ferrari 512CL for this example. 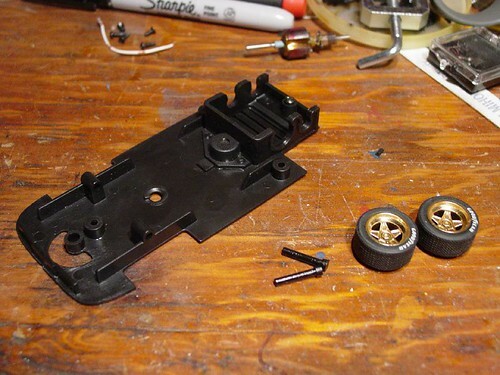 The "fix" will work with any of the sidewinder Fly Classic/GB Track cars that have the plastic stub front axles. I had already removed the front wheels and stub axles. Just give them a gentle pull and they come off. If you are going to glue the tires onto the rims now is the time to do this. First check the front rims to make sure they are reasonably round and trim away any flash or burrs on the wheel. I use Permatex clear windshield sealant for gluing tires, but any clear silicone adhesive will do. Some people use CA-glue (superglue) or contact cement (Permatex weatherstrip adhesive is a popular one) but the silicone has the advantage that it will allow you to take the tires off the rims later. 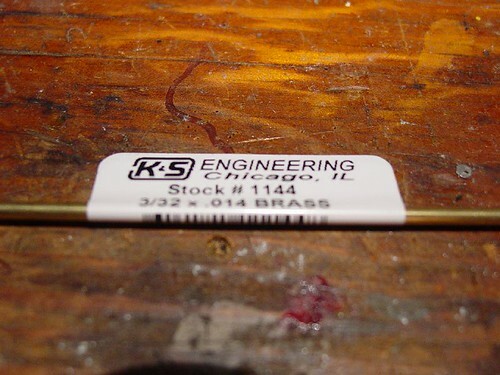 You will need to purchase K&S Stock #1144 Brass Tubing 3/32" by .014". If you are lucky you might have some laying around. This can also be done with aluminum or stainless steel tubing, or even 3/32" music wire- it's your choice. Obviously the aluminum is lightest but least durable, brass is heavier but more durable, piano wire is the heaviest (being solid wire) but the strongest. Choose the best trade off of weight for durability for your style of racing. I suppose you could start with a Koford M445F hollow titanium wing car axle but they are sort of expensive ($19.95). Better to put the money in new gears and rear axle when you get around to putting in the new drive train (odds are that you will want to). 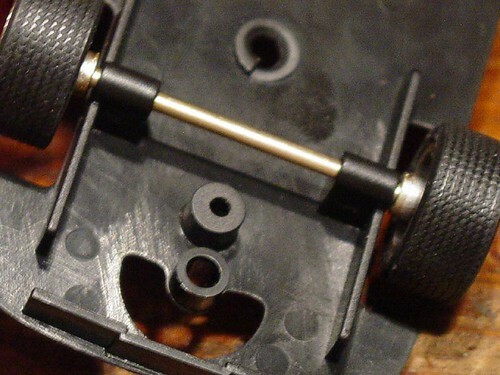 Take the Fly stub axles and tape them in place on the chassis. I used regular scotch tape- anything will do as long as it holds the axles steady. 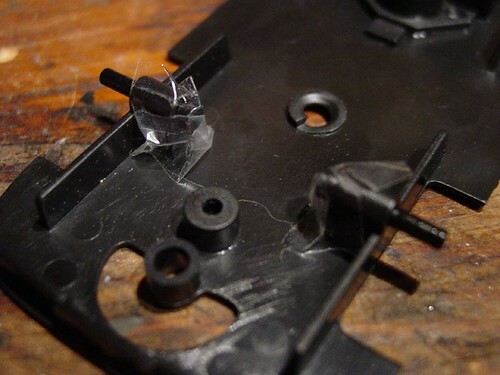 Make sure the inner collar is pressed against the inside of the chassis with no gaps. Measure the outside to outside of the stub axles. 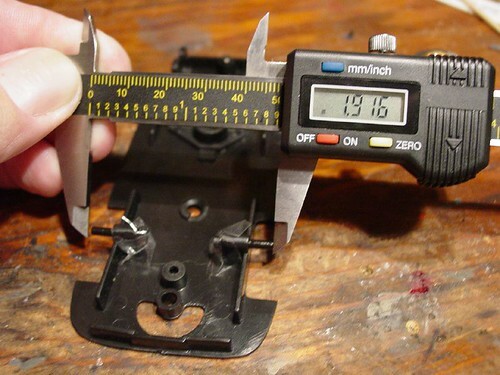 I am using a digital caliper that I bought cheaply from Harbor Freight. It's a good tool for your slot toolbox- it even comes with a spare battery and carrying case. You can also measure this with a machinist's 6" rule if you have one of those... or heck a piece of string like they used to do in NASCAR. Once you get the measurement you can remove the tape and the stub axles from the chassis. I have no clue what these stub axles can be used for; toss them in your spares box. 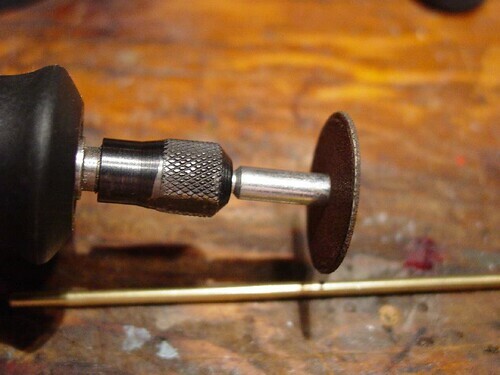 Take one of the ends of your tubing and file or grind it down to a cone shape on the end. 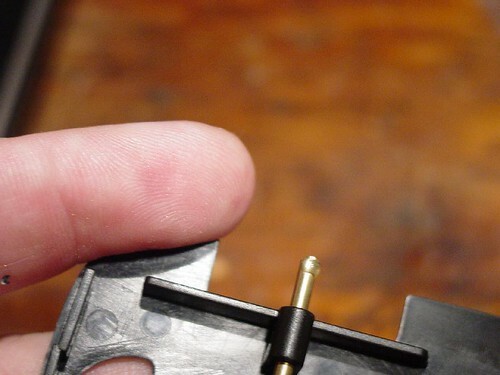 This is just to make it easy to insert into the plastic wheels and to make sure that you don't crack the wheels when you insert the brass tubing. A Dremel cut off disc is great for this job. It goes without saying that you should use eye protection and take standard precautions when working with any power tool. You can cut another tube easy enough but only get one set of eyes. 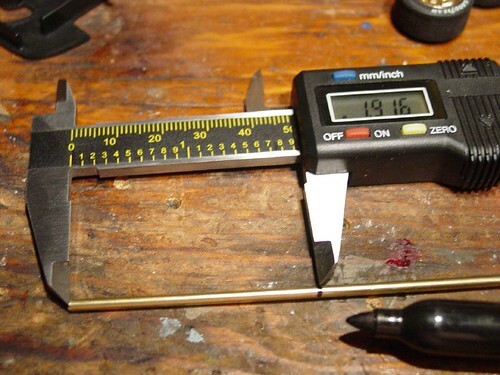 Next lay the tubing down on your workbench with your calipers or ruler next to it. Mark the length with a sharpie. Next use your Dremel cut off wheel to cut the tubing to length. I cut on the OUTSIDE of the sharpie mark to leave a little side to side movement in the front axle- cut right on the mark if you want little or no slop. Amazingly, you can cut tubing with a X-acto #11 knife. Just press the knife on the mark and roll the tubing back and forth until it cuts. It's easier than it sounds. Make the end we just cut cone shaped like the other end. This does not have to be beautiful as once we are done no one will see it. 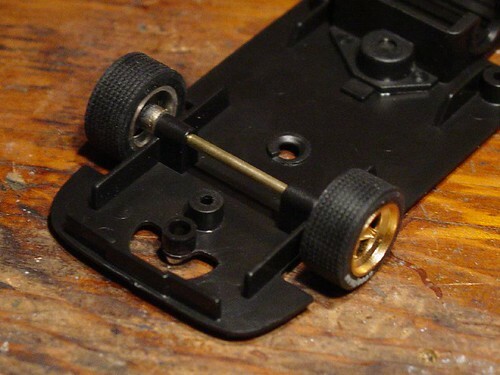 Some racers like to make a small chamfer in the outside of the chassis where the axle goes in- the theory is there will be less surface area for the back of the wheel to press against. I used a 3/16" Titanium drill just turned by hand. I personally don't think that this makes any difference so if you leave it out, no harm. Here's our new front axle inserted in the chassis- note that there is a very small amount of up and down play. If you press the wheels on the brass tube "axle" they will be a good fit. But just to be sure I am going to lock them on with Team Kinwald slow drying cement. This is just a CA cement (actually for RC cars) that I like to use because it comes in a easy to use applicator bottle. 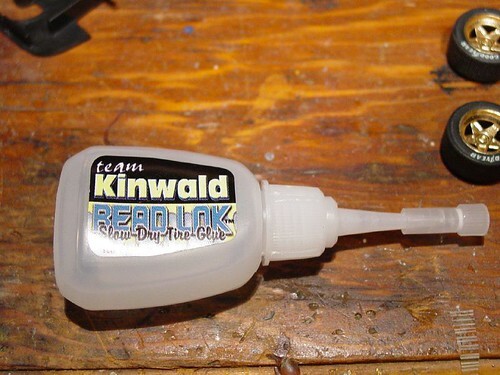 If your local hobby shop doesn't have it, Google for "Kinwald Trinity Glue" and you will find where you can buy some. Once you have this stuff you will find other uses for it. Put a SMALL drop of the glue near the end of the axle- I do mean SMALL. This is actually too much glue- use about half of this. Apply glue and press the wheels on each side. This is how it should look. Here's another view- you're all set. Some racers prefer an independent setup and also like to true their front tires. These topics are beyond the scope of this "how to". I would suggest that you now test fit the body/interior onto the chassis and make sure nothing is rubbing on the front tires, wheels or axle. Sometimes plastic from the front headlight buckets on some of the Fly Classics needs to be trimmed so it doesn't rub on the front tires. Lola T-70 coupes are famous for having this "defect". Use an X-Acto #11 knife or a scalpel to carefully trim any excess material that you find away. NOTE: some Fly classics have an interior that is long enough that the front edge will hit the axle/tube. The 908/3 is one of these. If you cut about a 1/4" of the front of the interior "tray" away with a razor saw or an X-Acto knife... it will clear the tubing and what you removed is not visible from the outside unless you look REAL hard. It is my experience that most 1/32 scale cars only load the outside wheel in a corner- and that the inside wheel is slightly off of the track. I feel that independent fronts ultimately don't make a significant difference in how a 1/32 scale car performs (I am sure that there will be corrections from people who have other opinions- which is fine). Your mileage may vary- yadda yadda. This is off the topic but if you keep the standard Fly plastic wheels on the Ferrari 512's, do yourself a favor and paint the wheel nuts (in the middle of the wheel, Fred) either a dull silver or steel. I feel that this small change makes a huuuuuuge difference in the realism of the car (when it's standing still that is). If you want to go a step further, you can tone down the gold with a wash of Tamiya Smoke (acrylic paint) to simulate brake dust. Last edited by MG Brown; 09-21-2007, 06:02 PM. Strange that you posted this right now because I had performed this exact same modification just a few hours before you posted this. My problem now is that the front end is sitting much higher than it was with the stock stub axles. This was because I loosened the stubs a tiny bit and the wheels were sitting on an angle. There isn't enough room to enlarge the hole upwards... Plus I don't think we're permitted to modify the chassis. I have a couple of 917's that I have done this mod to and they sit at what I would call a normal ride height. I would suggest checking that something else isn't causing the front end to ride too high (The 917 PA's have a problem where you have to fiddle with the body to get it to sit correctly). If that doesn't work, try turning down the front tires a little... Tip: the front tires mounted (not glued) on a REAR wheel will allow you to chuck the tires in a truing machine such as the one made by Hudy and turn them down a little. Well done, MG! Thanks for the mighty effort! Its high in the sense that before the change to the new wheels and tires, the car was actually resting mostly on the guide. 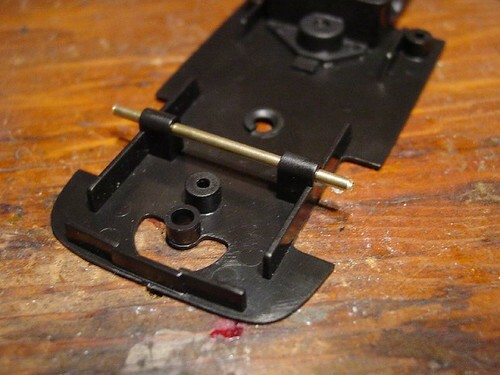 I had actually wanted it sit lower than this and ordered the Slot.It racing guide that is much thinner (the thickness of the plastic between the braids and the chassis if that makes sense). The guide now seems to be way too high. here is a picture of what I'm talking about. Underneath the car is dark, but since you can see left track rail you can see the gap between track level and how deep the guide could be resting. Nice Don King Hairpiece on top of the car! I'll look at a couple of 917's this weekend and see if I can give you a suggestion. Great write up MG. I use a little pipe cutter I bought at Canadian Tire for cutting brass tube. I've been using it to cut axle shims from brass stock and always file off the conical ends that it normally leaves at the cut. Sounds like just the ticket for cutting tubes for your front axle fix. I'll try this on a couple cars this weekend for sure. Thank-you for posting. Very useful "How To" Thread Mr Brown, and good of you to put it together so quickly today. I've slipped it over to Tech Q&A here and Stuck it for now (1/32 gets so many posts it would end up on the 2nd page in no time). As for ride height, I think that's got a lot to do with whether a racer is trying to create the most planted car possible, or simply maintain the great scale appearance of the original Fly while making it much more satisfyingly driveable. I have picked up a set of small round files (also at Cdn Tire as it happens) that help with these chassis adjustments. Heck, I picked up the same digital calipers as MG has at Canadian Tire as well as JB Weld, Loctite, Goop, hot glue sticks, and CA Glue not to mention other odds and ends. Someone should tell them that they are a slot shop in disguise. Looks like you need to shim that guide down so its better planted, Guitarman. Retired as Champion, rest in peace. I'm not entirely sure from the photos what the problem with ride height is. If the guide is bottoming out in the slot, or if it's something else. The guide should be easy to shave down. Last edited by Slider2; 09-21-2007, 11:50 PM. whenever gluing axles to hubs here is an important step to take to avoid squeeze-back(to the chassis) or squeeze-out through the "face" of the hub - I have done this. avoid this by using a pin drill, #60 is a good size; drill though the rim into the hub center post & into the axle socket. make sure the tailings are cleared. 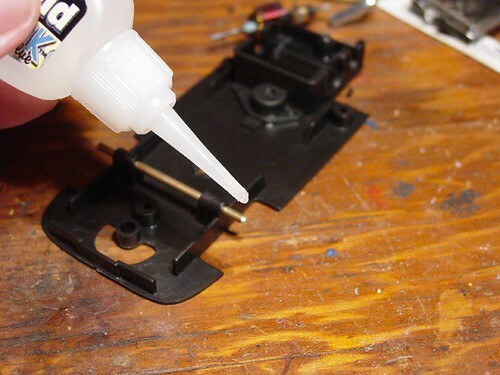 now, the excess glue will have somewhere to go that doesn't cause a problem. 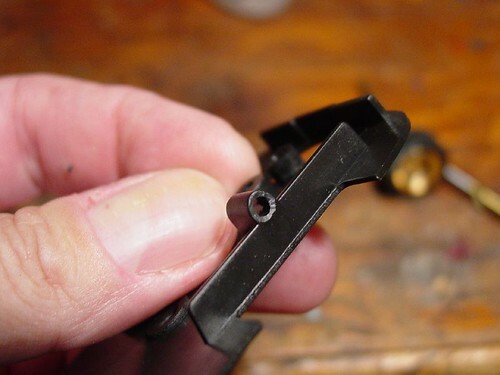 Martini917k's advice regarding drilling of an 'overflow' hole is great for use on solid axles... in MG Brown's article he uses brass tubing, which would negate the necessity of the hole because the excess glue would just flow back into the tube. So that got me thinking even more... if using tubing for front axle, suggest putting the glue into the wheel hub hole (you can then use a scrap piece of whatever to swab out any excess glue) - that way there is less of a chance of any excess glue ending up on the outside of the axle up next to the hub. Even with my modifications to the car, Its still over a second slower than a competitive car in the class. I think I may have a lemon. I did the same thing on my Spirit 512M- The only mod I did and it took 0.5 sec of my lap time. The front end was visably more stable down my long straight. I just used a piece of 3/32 piano wire, the job took about 2 minutes, not including taking off the body and putting it back on. If you're using a solid axle (and don't want to spoil the appearance of your wheels by drilling a pin hole in them) try grinding a flat spot on each end of the axle. Don't grind too much and don't grind so far along the axle that it's where it runs in the bushes. All times are GMT-8. 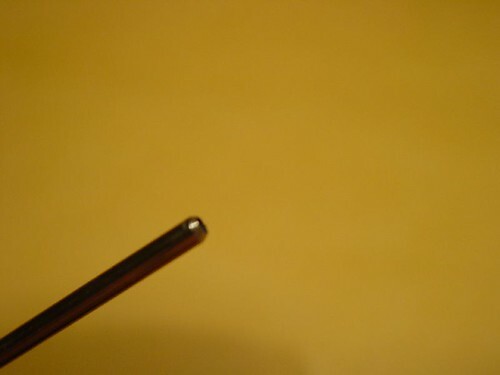 This page was generated at 05:34 PM.